The purpose of this article is to discuss what Chiropractic is and how the adjustment works to facilitate the natural healing processes in the body. In order to dive deeply into these topics, we must also cover the relevant anatomy. Chiropractic is a type of healthcare that focuses on treating issues of the neuromusculoskeletal system without the use of drugs or surgery. In other words, this means that Chiropractic care focuses on the interplay between the muscles, the skeletal bones, and the nervous system. Chiropractors accomplish this by using Chiropractic adjustments. These are a non-invasive techniques that are designed to optimize the functioning of the joints and muscles in the body. The skeletal bones provide structure to the human body. They serve as scaffolding to our muscles, and as protection to certain organ systems such as the spinal cord, brain, heart and lungs. Muscles are what allow us to move and stabilize these skeletal bones. The nervous system is the master control system. It is composed of the brain, spinal cord and all the nerves in the body. It controls every tissue and every cell. The nervous system also functions as an information highway- passing messages from the brain to the body and vice versa. The spinal cord is encased and protected by the spine. 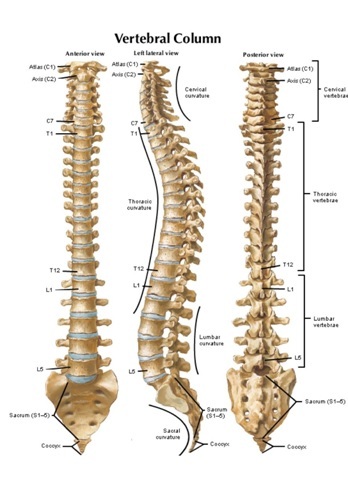 The spine is composed of 24 moveable bones called vertebrae. Separating one vertebrae from another is a cartilaginous cushion known as the intervertebral disc.The discs serve two functions: they act as shock absorbers, and as ball bearings- allowing you to turn, twist and bend. In between two vertebra and a disc, are small openings called intervertebral foramen (IVF for short). It is through these openings that direct projections of the spinal cord emit. These projections are called nerves, and they travel throughout the body to innervate every organ system, tissue and cell. The spinal cord and its related nerve projections are the communication lines from the brain to the body, and from the body back to the brain. In addition to housing the nerve roots, the IVF also contains an artery, a vein a lymphatic channel and a fat pad. Because of all the structures that live within the IVF, tolerances are very tight. Misalignment of spinal joints will result in abnormal motion. This means that joint surfaces will not be moving across each other in the way in which they were designed. These misalignments will change the mechanics of the joint and the muscles that surround it. This leads to a build up of inflammation. Inflammation causes irritation of the nerve root. This irritation causes the nerves to send pain signals to the brain, and prevents injured tissues from healing properly. In addition to the inflammatory response, the muscles that surround the affected joint will go into a reactionary spasm. This muscle spasm is a protective mechanism. It is employed by the nervous system, and is in an attempt to limit the amount of damage that occurs to joints that are not moving properly. Over time, these hyperactive muscles can create altered movement patterns. These movement patterns are yet another attempt by your body to compensate for improper joint function. These strategies keep you moving in the present, but ultimately will predispose you to further (and more serious) injury. A Chiropractor’s job is to identify areas in the body where joint misalignment has occurred. Once the joint dysfunction has been identified, a specific and directed Chiropractic adjustment can then be performed. The purpose of an adjustment is to correct joint misalignment, and ensure that the body is functioning optimally. Once this correction is obtained, the irritation to the nervous system is removed. This will allow inflammation and muscle spasm in the area to dissipate. It is at this point that the body can begin to do what it does best- heal itself! When the joints in your body are functioning properly, you are able to move well and live your life pain free. There are many different adjusting styles and techniques out there, but all are aimed at accomplishing the same thing- correcting joint alignment and achieving optimal function of the human body. Chiropractic care is a safe and effective way to treat and prevent injury to the neuromusculoskeletal system. To learn more about how Chiropractic care can help you, stop by our office and set up a free consultation!